(Roseburg, Oregon) - Black bears are being seen more frequently in western Oregon this summer. The Oregon Department of Fish and Wildlife has some tips to avoid problems with bears. In Coos Bay and the mid-coast district, several bears have been killed for human safety and damage reasons. Damage complaints have increased in the southern Willamette Valley and North Coast. 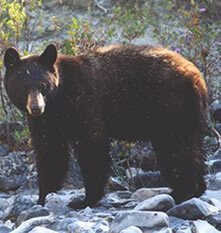 The Klamath district also reports bear problems. She asks landowners to do their part and practice good bear etiquette. Keep garbage inside. Pour ammonia or bleach over the trash before leaving it outside for pick-up. Store pet food dishes and feed inside. Hang bird feeders away from the side of your home or tree trunk so bears can’t reach them. Store birdseed inside and keep the feeder and area underneath clean. Pick up fruit that has fallen from trees. Bear hunting season opened Aug. 1 statewide. Landowners with bear damage that desire hunters on their property should contact their local ODFW field office. Give the bear a way to escape. Stay calm, do not run or make sudden movements. Face the bear and back away slowly. Avoid direct eye contact with the bear. Talk to the bear in a firm voice to let it know you are a human. Fight back if attacked. Shout, use rocks, sticks and hands to fend off an attack.